This topic contains 6 replies, has 4 voices, and was last updated by dave-p 5 months, 3 weeks ago. This topic was modified 6 months ago by dave-p.
Dave, the BMB Plowmate has two forward and one reverse gear. Not sure about axle, it may have independant clutches for steering, dont think it has a differential. The Plowmate does have a differential which makes it very good at turning and manouvering in tight spaces, but the one thing it does not have is a diff lock to lock both wheels together. This results in the machine having a tendency to spin the landwheel constantly and it is nearly impossible to keep in a straight line when you encounter normal field conditions. It works fine on well-tilled ground (which is what it was designed for) but these days most ploughing matches are held on open fields with hard, compacted soil. Both the Trusty and the Anzani will cope with these conditions because they have a positive drive to both wheels and you have to disengage a wheel to turn them (i.e. neither has a differential). That is why these machines dominate so much; if you want something different have you thought of a two-wheeled Garner tractor? They are hard to find but are certainly unusual. 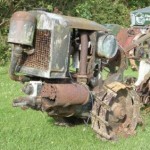 The Barford would struggle even with wheel weights, the plough also lacks fine adjustment. Again not really designed to plough hard ground. 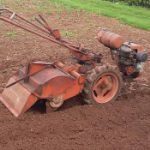 Other machines that should cope with ploughing match conditions are Rototiller 56 or Rowtrac although neither has a great degree of adjustment on the plough. 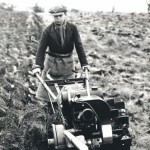 I can personally vouch what Geoff says , my Father-in-Law had a BMB , and it was my TASK to plough his land with it , there were times when I would rather have been armed with a spade , they are very difficult to handle , unbalanced , and as Geoff says , almost impossible to keep in a straight line. The plough itself on a Trusty is in a class of its own , but remember most trustys lack reverse. Others to consider are a Clifford , which has a multi adjustable plough very similar to the Trusty.The Howard 700 is a very underated machine ploughing wise , reverse gear , and a seperate difflock……..food for thought perhaps.